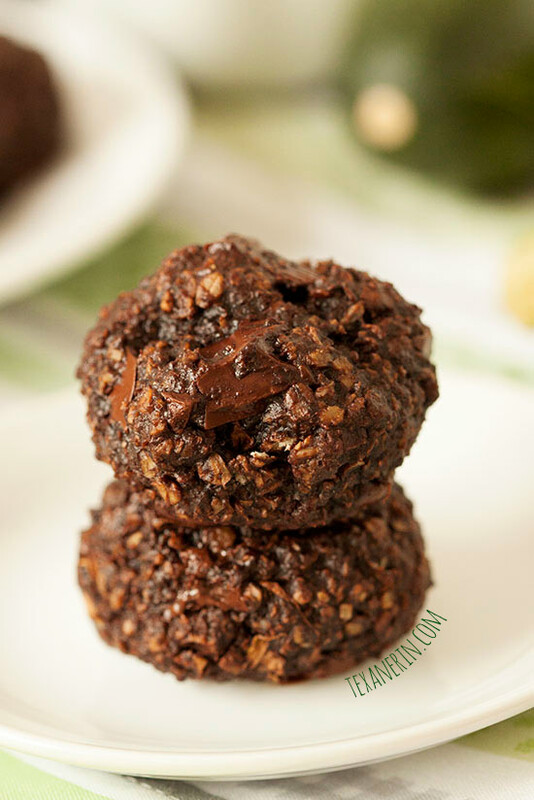 Soft and fudgy chocolate zucchini cookies made with whole grain flour and which also happen to be dairy-free! I was excited about baking with zucchini after I made this chocolate zucchini cake last year so I bought a few bags of zucchini, which was perhaps overkill for the one recipe I wanted to make. So I’ve been baking up zucchini everything. First we have these cookies, which are super soft and chocolately and get most of their sweetness from the chocolate chips. I’m kind of surprised by the dough’s lack of sweetness. There’s quite a bit of coconut sugar in there already but I wouldn’t reduce it. Not if you want these to be sweet, which is how I usually like my cookies. ;) And that would also make them more cakey and less fudgy. I have to admit that I’m kind of nervous posting recipes with zucchini. The water content seems to vary from zucchini to zucchini so I’m a little scared that the recipes will come out differently for other people. I used a medium Microplane grater and would recommend not using a fine or coarse grater because your cookies might come out differently. You only bake these cookies for 6 minutes, but I did a lot of testing. In batch after batch, 7 minutes was already too long. These should be very soft and kind of fudgy but if you over bake them they will be cakey. And cakey cookies ain’t cool. When you check them, be sure not to confuse melted chocolate chips with uncooked dough. You don’t want the dough to be raw, but it goes from just perfect to overcooked quickly so don’t leave them in much longer than 6 minutes if you’re worried about the cookies being underdone. It’s a simple recipe but you do have to chill the dough. If you don’t, the dough will be more like a batter. After chilling it, the dough should be scoopable, like regular cookie dough. If you’re in a hurry, flatten it into a disc, wrap in plastic wrap and stick it in the freezer. In a large bowl, combine all the wet ingredients (coconut oil through zucchini) together and set this aside. In a medium bowl, mix together the flour through salt. Add the dry mix to the wet and stir, just until combined. Cover and refrigerate the dough for at least 2 hours. It should be scoopable and no longer runny. Preheat the oven to 350 degrees F (176 degrees C). Line a baking sheet with a Silpat or piece of parchment paper. Form the dough into 1 1/2" balls and place 2 inches apart on the baking sheet. Bake for 6 minutes. They will still be very soft when you remove them from the often but they will continue to cook. Immediately remove the cookies from the cookie sheet and let cool on a wire rack. To make your own quick oats, pulse traditional rolled oats in a coffee grinder (once) or food processor (3-5 times) until the oats resemble quick oats. To make your own oat flour, grind quick oats in the same way until they resemble flour. In my coffee grinder, this takes only 2-3 seconds but it'll take a little longer in a food processor. 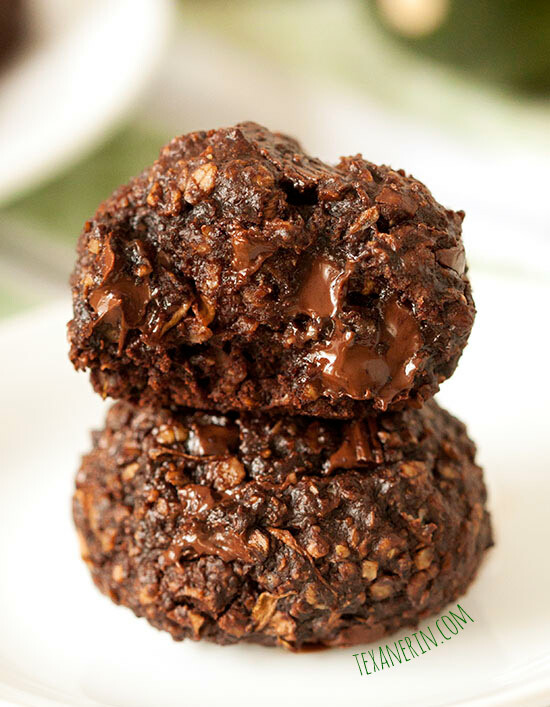 52 comments on “Chocolate Zucchini Cookies (100% whole grain, dairy-free)” — Add one! Do you think you could replace the whole wheat/spelt flour with more oats/oat flour? Unfortunately not. The lack of gluten would most likely cause the cookies to fall apart. 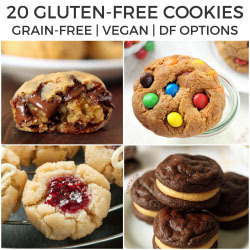 When I change a cookie recipe like this to be gluten-free, I normally add a binder like almond butter but I have no idea how much you’d need here. You could also try xanthan gum, although I have no experience with that. Sorry about that! I’m very glad I made these. They’re very yummy. You’re right about the 6min rule, though I liked my 9min-cookies a lot as well (I kept taking out one row after each minute of baking and putting the rest back into the oven, so I can see the difference). I’m not sure what ‘cakey’ means, does that mean drier, crumblier? Like ‘fudgy’ but without the moist and sticky quality? (I wonder if the zucchini helps make them fudgy). I’m a bit paranoid about undercooked eggs (getting sick from that just once will make people like that), so I wonder if you think they’d be ok with flax or chia eggs? Or maybe you have a good argument that 6 mins is enough for the egg to be done? Also, my dough wasn’t runny at all, what’s up with that? In fact, after refrigerating it became hard as a rock. Did I do something wrong? (I did sub 70% butter for the oil, could that have something to do with it? But it shouldn’t, since coconut oil gets much more ‘rocky’ in the fridge). And they didn’t spread one mm in the oven, there was no need for too much space between them. Oh, and btw, I think you may have forgotten to add “a pinch of salt” to the recipe. I’ve learned that that’s a must in all deserts, to accentuate the flavors. I’m just telling you in case you may have forgotten to write that, of course it’s up to you if you put that into your sweets and recipes. Hi! Do you have to use whole wheat or spelt flour, or can you just use regular old white flour for your recipes? UMMMMMM…… YUMM ! By the way the way, the dough is scrumptious too. Don`t yell at me ! I know it has a raw egg. Mine was a fresh yard egg, out of my own yard. Love recipes like this !!! Wonder if this would work with frozen shredded zucchini that I squeezed all the liquid out of?? These look absolutely incredible! Love that first picture! A friend of mine tried zucchini cookies and they were so bland and flavorless and cakey. Yuck! I’m willing to bet that yours, chocolate + underbaked = perfection! Nooooo! ;) They’re not underbaked. They’re baked just to the point that they’re done… any more and they’ll be cakey! These sound delicious. I have made zucchini bread before so will have to try these. Finally! a way to get rid of all this zucchini! Haha. It’s definitely better than eating them raw or cooked, isn’t it? I have had zucchini bread but never in a cookie. Love this twist and that you added chocolate. These are a must try!!! Erin these cookies are great, I totally want to take a bite of that melting chocolate! Love the se of zucchini. Thanks, Suzanne! And yeah. What’s better than melty chocolate? Yum. Oh man, those gooey chocolate chips are calling my name! I haven’t done nearly enough baking with zucchini this summer – I need to get on it before it’s too late! At least zucchini are a year round thing. :) They just have their peak in summer, right? Or am I making that up? These look great! I’ll definitely have to try them! These cookies look seriously delicious!!! I love the way cookies cook so fast. It’s like instant gratification when they are done baking. But I do have to wonder what zucchini does for things in baked goods. Does it do anything special…. or is it just a sneaky way of including veggies in kids treats? In these, I’d say that they’re just something sneaky. In my next zucchini post, they add a ton of moisture. So much you don’t need any oil / fat! Wow! These look amazing and I would absolutely never guess that there is zucchini inside! Yum – I love how fudgy these are! I have a zucchini I just picked from the garden, not to decide what to do with it! I was thinking brownies, but now I am not sure! Oh my heavens Erin!!! These look amazing! To die for – heavenly – outrageous! I haven’t baked with any zucchini yet this summer. Gasp!! I have to change that asap, I know. I can’t believe how fudgy and chocolatey these are. :) Must make! Thanks, Sally! And I can’t wait to see what you come up with zucchini. I know it’ll be killer, whatever it is! Another healthy but full of chocolate recipe :D Love it Erin! And will try it soon for sure. I need these in my life!!!!! I love baking with zucchini and chocolate is always the answer. What a fun and delicious looking recipe, those melting cc are very enticing! Lawdy, lawdy! These look so gooey and delicious. I’ve been hoarding zucchinis and making zucchini muffins left and right — this looks like a good second use for them! yum. Haha. Hoarding them? Stop that! They’re everywhere! :D And yes, this would indeed be a good second use! 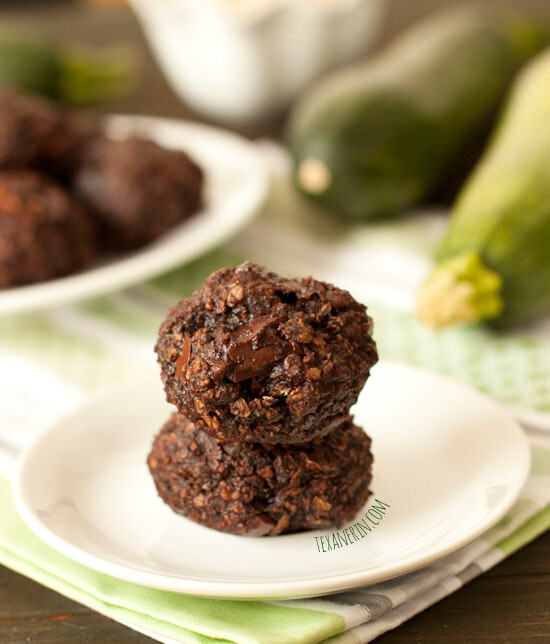 I love tucking zucchini into chocolate treats – these cookies look so good! Now the next challenge is using them in non-chocoately treats! I don’t know if I’m up for it.